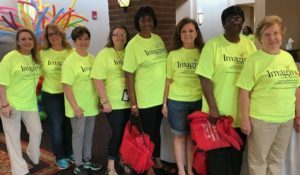 Tupelo Social Services Coordinator Keri Dykes (fourth from left) recently volunteered at the annual Imagine the Possibilities career expo, sponsored by the CREATE Foundation, a group committed to improving the quality of life for those in Northeast Mississippi. During the three-day event, 7,200 eighth graders from 75 schools in 17 Mississippi counties attended. The interactive expo exposed students to many different career paths through hands-on activities. Dykes served on the welcoming committee by greeting arriving students, directing them to different stations and assisting teachers. Dykes was one of over 700 volunteers.